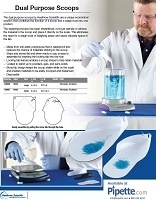 The Dual Purpose Lab Scoops from Heathrow Scientific is a unique economical solution that combines the functions of a scoop and a weigh boat into one unique product. The weighing process has been streamlined by the Dual Purpose Lab Scoops from Heathrow Scientific with this new and refreshing approach. Now you can just sample or retrieve the material in the scoop and place it directly on the scale, without the need for a separate weigh boat. This elimination of the need for a weigh boat or weighing paper saves valuable space in the lab as well as saving your lab budget. When you are finished the dual solution scoop is easily and readily disposable. 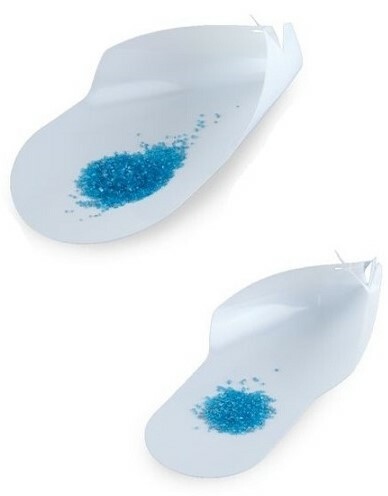 The Dual Purpose Lab Scoops from Heathrow Scientific is made from anti static polystyrene that is waterproof and reduces the chance of materials sticking to the scoop during use. The Dual Purpose Lab Scoops from Heathrow Scientific ships and stores flat for convenience. When ready to use, the Dual Purpose Lab Scoops from Heathrow Scientific is easy to assemble by simply inserting the locking tab into the hole. 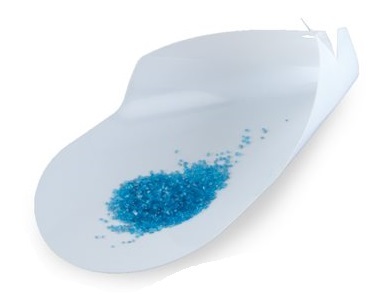 The locking tab feature of the Dual Purpose Lab Scoops from Heathrow Scientific enables a scoop shape to be formed to help keep materials where they should stay. The broad tip design keeps the scoop stable while on the scale and enables materials to be easily scooped and dispensed. The scoop can also be used flat as an alternative to weighing paper.